Are you looking for some help with internal medicine personal statement? Feel free to use help of our personal statement writers! We’ve prepared a great residency personal statement for you! I knew I always wanted to practice medicine, but it wasn’t until I worked for an internist for six years that I discovered the specific field I wished to pursue. While I found working with the entire body intriguing, I felt restricted by the patient population that internal medicine offers. Thus I made the decision to focus on family medicine because it would allow me to focus on the whole body as well as patients of all ages while addressing pediatric concerns and women’s health issues too. The family medicine residency offered at your institution will help me fine tune the medical skills I have acquired, develop my own bedside manner and establish meaningful patient relationships necessary for a career in family medicine. In addition to providing an academic atmosphere that promotes excellence, the emphasis this residency places on team work and open dialogue will allow me to concentrate on the fundamentals of superior patient care and develop a solid understanding of the roles and responsibilities of being a family medicine physician. A residency such as yours will allow me to become a competent and independent clinician by providing a supported autonomous program that will allow me to work independently with patients while still under the guidance of physicians and mentors. While my experiences have influenced the direction I wish to pursue, they have also helped me develop important skills that will benefit me in this residency, help prepare me for medical boards as well as shape the physician I wish to become. My ability to communicate and empathize with others combined with my strong interpersonal skills have accentuated my ability to make connections with others; specifically patients. Being able to work and communicate easily with young patients or the elderly have made it easier to learn new information and will be a valuable asset for a family medicine physician. My dedication to my career and my strong work ethic along with my experience and desire to continue learning make me the ideal candidate for this residency. As a family medicine resident I will be laying the foundation for a long, successful career as a family medicine physician. I will have the academic acumen and hands-on experience to continue my education with a fellowship before starting a private practice. Once I am working as a physician, I plan on offering more than exceptional care to my patients, I want to make valuable contributions to the medical field. Not only will I utilize the research skills I have gain in this residency to help diagnose patients, I will also be able to focus on the advancement of standard care and innovation too. I look forward to being a resident in such a rigorous, yet supportive learning environment that will transform me from a student to a physician. After spending so many years observing and applying what I have learned during my rotations, I am ready to commit to patient care, collaborating with peers and building lasting relationships with other medical professionals and our patients. What specifically drew you to this field versus other fields in medicine? What experiences in medical school support your readiness for residency in this field? What do you hope to gain from this residency program? What are your plans for the future – do you wish to complete a fellowship? How has your medical education so far prepared you for residency? What specifically about this residency program makes you want to be a part of it? What do you want to do as a physician – what are your medical goals? Do you want to be involved in research and teaching, or run your own practice? According to experts, you should write a personal statement, as if you are narrating a story. If you are looking for a family medicine residency personal statement sample or personal statement quotes, you can find many online. But to copy from an online source is not a good idea. You have to write your personal statement, if you want to secure your admission. Here are few tips, which can help you to write a good personal statement. Be original: Copy from any source will not serve the purpose. If you are writing personal statement family medicine, you have to be yourself. Write about your ideas and interests in the field. Create a unique story: You have to leave a long-lasting impression on the mind of the reader. Your Family medicine statement of purpose should be strong enough to stand out from the rest of applications. 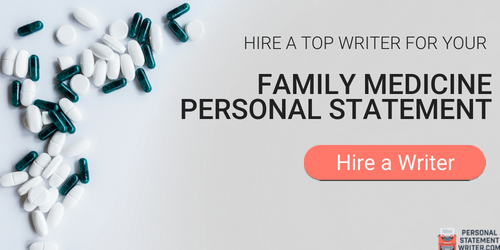 Organization: Write your personal statement family medicine is an organized way. Things should be coherent with each other and one thing should be linked with other. A haphazard statement will leave a wrong impression. Review and edit: When you are done with your family medicine statement of purpose, you need to review it again. Edit it and review it again and keep editing it until you get satisfied. Get an opinion from the expert: You can show it to your senior or teacher for an expert opinion. They can guide you and edit it again. We have a team of professional experts, who can help you in writing a family medicine statement of purpose. Not only that, we can help in writing a verity of other documents too, which include scholarship essay, admission essay, letter of intent, letter of recommendation, resume, diversity statement etc. Writing personal statement with the help of the family medicine residency personal statement sample is not a good idea. Instead of that, our experts can provide you with original and completely customized documents, in a very affordable price. 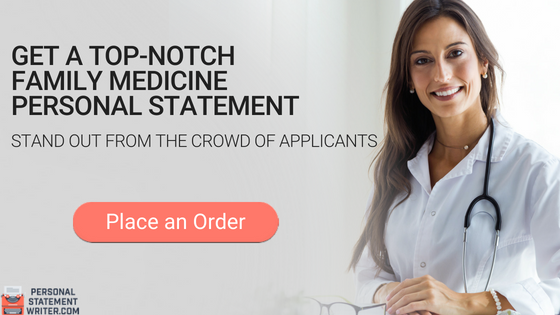 If you want to order a personal statement family medicine, the process is very simple. You have to visit the website, where you will find order now button. Click on that and you will be redirected to order page. You will be asked about a little personal detail, like contact number and name. This information is kept strictly confidential and is not shared with anyone in any case. After that, you will be asked about the details of your order. The type of document you want, number of pages, the time duration and any other minute details, which you want to share with us. In the last step, you will be asked to make the payment. Different methods are available; you can choose one according to your choice. Once you make the payment your order is confirmed and you will get it within the given time. Personal statement family medicine is a serious task. Let our professional experts help you. Call us now!